To plunder…er… adventure new worlds! Well I see a large bird that could hit a rotor. Just saying. They’ve gone to join the Trespassers Society .. err .. the Explorers Society: to seek out new life and new food, to boldly go where no one has ever gone before (except those that already live there but they don’t count). I think they fall under the “new life, new civilizations” category. 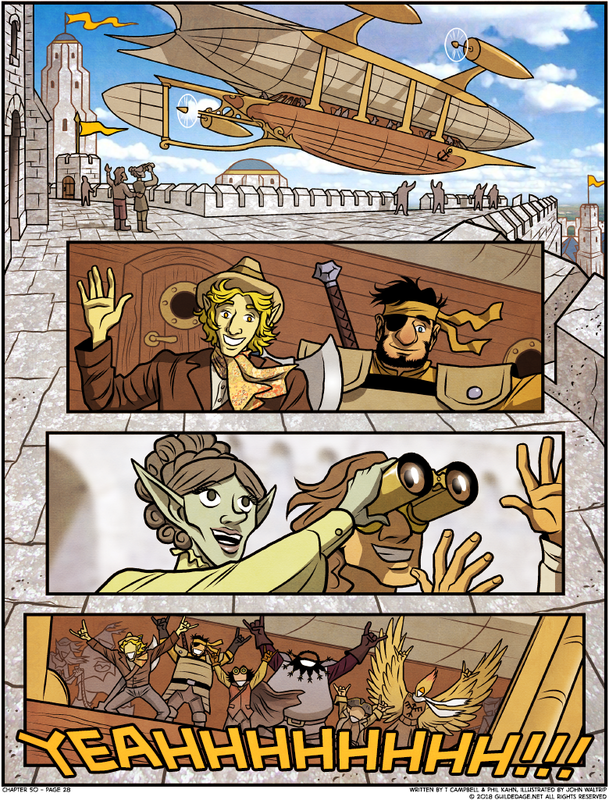 Ain’t no party like an adventuring party cause an adventuring party don’t stop. Will we ever get to the point where Best finds a lonely grave, unmourned etc.? Or was that supposed to be some kind of metaphor that I just failed to catch up on? I dunno after redeeming him I refuse to see bad things happen to best. Let him have a Happy End Dangit. I think the point is that he made peace with his absurd need for affirmation. A peaceful death IS a happy end, if death is inevitable. It’s also a happy end in most of the fantasy universes I know, because the means of immortality are … deeply unpleasant and may well involve what is in effect a protracted death at the hands of an otherized ID. As the epilogue is written/told by Gravedust, I’m guessing we won’t see it. If Gravedust would know about the grave of Best, it would probably not be unmourned. I just went back to check to make sure, and it never mentioned “unmourned” in either case. First time, Syr’Ng’s comment was “He saw a grave. At the top of a hill, under a tree. Alone.” And with Weo it was “just because you’re going to have a lonely grave doesn’t mean you don’t have a great destiny ahead of you”. So it could be visited occasionally, just a lonely grave. I originally thought that Best would have the lonely grave because he’d somehow sacrifice himself getting the rest of them out of the game, and his grave would be ingame only, thus alone. But, obviously, we have gone beyond that point so my theory can’t work anymore. I think maybe now, he might… choose? a lonely grave? I’m not sure why, but I think now that he’s come to terms with it, he may end up doing something like that in his old age, if he reaches it, and just want a peaceful, quiet place to rest. I’ll take “neither.” He’s a young man. He’ll wind up in a lonely, unmarked grave…in fifty years or so, if elves in this world age at human race, or potentially in around two thousand years if they don’t. Perhaps the lonely grave is in sepia world..? Cos those tubes were lonely graves if ever there were. Also, we don’t yet know what is going on there in terms of what Shanna and Co have reported to the world regarding the players’ identities. So… Their graves could still be lonely. I’mma just read this thing. I never guess right, it’s always better than I can predict!! yeah, i wanted to suggest Sepia world too. what if the grave he saw was actually the Player grave, maybe the Player was an unloved egomaniac without friends in the “real” world but finally found his home and place in Arkerra amongst a Family that is as chaotic as he is. it would make for a great Story ending. And even thought i hated the guy for most of the Comic and still think he is overrated , i am okay with him getting a happy ending like this. Adventure awaits. No matter what we may think, there is always something to find out there! No, no, no. You’re supposed to do that when someone puts on *sunglasses*, not binoculars!